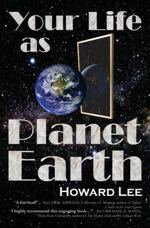 The second half of the book shows how scientists have discovered so much about our past. It’s a fascinating account of the enormous range of techniques and ingenuity by which the progression of events and processes has been discovered. Plate tectonics is a stand-out in geology: “In short, it is geology’s unifying theory.” The evidence for evolution is overwhelming. It has been established in the fossil records and in the genes, anatomy and biochemistry of living things today. We have also come to understand that the evolution of life has been an integral part of the planet’s evolution. Turning to the evidence for past climates Lee explains the numerous proxies by which past temperatures and carbon dioxide levels can be established and confirmed, along with the accompanying behaviour of the oceans. There are uncertainties of course, and there is more to be discovered, but the overall picture to date is impressive in its detail. Carbon dioxide and temperature have moved in lockstep throughout most of Earth’s history, with the gas being both a driver of and responder to warming. The gauging of carbon dioxide levels through the climate changes of the past is, Lee emphasises, crucial to our understanding of how the planet will respond to the rising levels of today. Lee’s survey of what has been discovered about past climates covers territory mostly familiar to readers who follow climate science, but it is marked by the completeness of its range and the writer’s ability to make complex matters clear to non-scientists. He has a light touch, but achieves admirable clarity in his explanations. Alarm is, Lee thinks, an entirely appropriate response to scientists’ projections of Miocene-like or maybe even end-Triassic-like conditions for our grandchildren’s world and beyond. He fervently hopes for some unforeseen cooling feedback “to swoop in like a fairytale hero, saving us from destructive climate change”. But Earth’s past shows no sign of that. The book is testimony to the high worth of the patient processes of the scientific community. The piecing together of Earth’s past is a triumph of human intelligence. It also obviously carries high import for our future as we keep raising the level of carbon dioxide by continuing to burn fossil fuels. But if science brings understanding it takes politicians to act on scientific information, and at the end of his book Lee reflects on the complete disregard for science shown by many top political leaders. He writes of “the burden of ignorance in the upper echelons of power”. That spectacle is particularly apparent in America where Lee lives. But while I was settling to write this review I viewed for the second time Alister Barry’s documentary Hot Air screened by Maori Television. Watching the dismal progression of political and business leaders in supposedly well-educated New Zealand scrambling to evade or deny the issue of rising emissions was a depressing experience. All the more while reading yet another clear and compelling explanation of the scientific conclusions which any of those leading figures would be capable of understanding. Lee ventures reflection on what we must do if we are to pull back from invoking the worst consequences of climate change. In this discussion I thought he surrendered too readily to the notion that decarbonisation of our energy systems within the necessary time frame is too much for us to accomplish. He appears influenced by Roger Pielke on this point. If the message from Earth’s past is allowed to finally break through into the public consciousness we may surprise ourselves by the speed with which we can move. But that’s a very big if. Very interesting, Bryan. Governments can’t or won’t act; but I despair of individuals acting. While getting rid of some Christmas gift wrapping recently, I had a visit from a couple I know well. They are intelligent, educated people but as I sorted reusables and recyclables I could see they were somewhat amused. I finished up with a small block of landfill rubbish that would have fitted into a tablespoon. I know for a fact that my friends would have heaved the whole lot into the general rubbish. They think I’m p***ing into the wind with my efforts and maybe they’re right. Fern I think individual efforts are worth making,if only for one’s own sense of integrity, but waiting for them to add up to substantial change would be like waiting for charity to overcome poverty or road courtesy to overcome the need for rules. Only political and business leaders have the power to achieve the kind of major transformation in energy production and use needed. We have to keep at them, however resistant they are to action. The more widespread the public pressure they feel the better. Quite right Andy. Individuals taking action such as providing some of their own energy needs by means of solar panels or fossil fuel free transport, relocation to within a close distance to work etc. add up to a significant contribution. Overall though, Bryan is right. Only concerted action through wise leadership by governments will change the hubris of the “bottomless” fossil fuel well… that has been the mantra of our exponential growth predicated society. We need to face the reality of our “one plant” society and do significantly better at it than the “one island” society of the Easter Islanders, that Diamond talked about eloquently in his “collapse” book. Apparently though some of us still believe in Santa Claus and the right to burn every once of the black stuff still in the ground. Wonder what was left out in their education or in the grey stuff between their ears…. Good luck with the government. I am sure the next COP in Paris will work out. Or, maybe, the one after that, …. With the rising thermometers the need for luck will eventually evaporate as the “deniers” and “procrastinators” will be leaving the room quietly in the end, in order not to be embarrassed face to face by the total hogwash they have dished up all these years. Broaden your scope of hypotheses Andy! For example: what if the denier was actually a Rat, trained to leave sinking ships before its too late? Uber Rats like Senator Inhofe however, have chained their souls to the ballast of the ship. No hope of survival for him in the world of the living. Only zombidome remains as an option for that Rat. In your case, well, you could try a new Moniker and Pseudonym and rebirth on the others side as a proponent of action to curb climate change…. I could try a “rebirth” as a rat and see if someone in the wind industry will employ me. Don’t think the wind industry needs rats… btw. you missed the point: you don’t need to be reborn to become a rat. And I thought you’d choose something more pleasant next time around…. Yes, all vacancies have been filled, but we have your CV on file and will contact you should an opportunity arise. Just as an aside: last year’s WordPress roundup has HT’s top commenters as Andy with over 1,000 comments and Thomas with just under 500. Maybe we could get some raw data. I need to verify this hockey stick …. Agree that personal efforts help with climate change issues, but only the government and corporate sector can make the big differences, and provide the leadership. With rising temperatures the deniers and procrastinators may indeed leave the room in quiet embarrassment. In addition many of them will deny they were really deniers, and the rest will find some way to blame the science community.These sorts of people never admit they were wrong, or take responsibility. They just make those demands of others. Of course we can all make a difference by getting on Twitter and demanding that we take action. A suitable hashtag like #takeaction is quite good. If everybody got on Twitter and urged everyone else to get on Twitter and demand that everyone that uses Twitter takes action, then we would all see the same hashtag. Obviously the deniers will deny that they are deniers. That is the nature of being a denier, you just deny everything, including that one is a denier. You, Andy, would know, I suppose. Actually it is a play on words and a vague reference to Bertrand Russell’s barber paradox. Is the following sentence true, he asked..
– the Haida ocean fertilisation experiment off Canada, though roundly condemned by many scientists and ecology organizations ( and by Naomi Klein in her last book ) seems to have had no noticeable bad effects on the ocean, and very noticeable good effects on fish stocks. Whether it contributed much to CO2 sequestration is uncertain, but hopefully more, and better monitored, trials will follow.